Viral media saw an interesting development last week with Invisible Children’s release of its “Kony 2012” film, which at the time of this writing has garnered well over 75 million views as well as storms of heated criticism. One could practically write entire books on the issues that Invisible Children raises – both intentionally and unintentionally – in this campaign, but for the purposes of this post I want to keep the focus fairly narrow and trained on the actual components of the video that make it successfully viral – and what that potentially indicates about how information regarding especially complex issues is diffused, as well as what difference that form of diffusion makes. What makes Kony 2012 so powerful? Because regardless of where you come down on the issues raised in the links above, it is undeniably powerful, at least in terms of its primary goal, which was essentially to get people’s attention. First, it makes direct appeals to the emotions of its viewers. This is not by any means a new tactic; pity has long been a tool of charity work, and is often an effective one. The Kony 2012 video moves past pity and seeks to inspire outrage, hope, and finally a sense of personal empowerment on the part of the viewer, a sense that by watching the video the viewer has already done something important and impactful. This sense of accomplishment and empowerment can be intensified by the sharing of the video and the viewer’s demand that others follow suit. The video presents the ignorance of the developed West as its primary sin and the primary obstacle in the way of Joseph Kony being brought to justice; it therefore implicitly offers the simple fact of “awareness” as a form of blanket solution to this problem, with the supposition that action will necessarily follow. 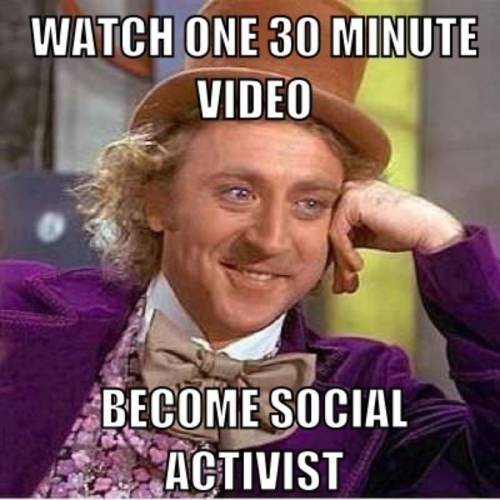 Viewing and sharing the video therefore offer an emotionally powerful but objectively questionable experience: the sense of having taken active part in something both significantly communal and directly world-altering. This leads me to the second and arguably more important aspect of what made Kony 2012 so successful: In the interest of making its emotion-based appeal, it employs a starkly simple and appealing narrative. This narrative presents an extremely complex, problematic, and history-laden situation as a straightforward tale of good and evil, innocence and wickedness, power and weakness – but not the kind of story about power that it might tell. Invisible Children’s narrative is careful to tread nowhere near accusations of First World privilege or racism, and – again – presents ignorance as the West’s primary sin. The Ugandan government is presented as a lesser protagonist in need of help in capturing Kony rather than as the highly troubling entity that it actually is. Kony’s abducted child soldiers are presented as innocent victims in need of rescue, rather than in terms of their much more problematic statuses as both victims and perpetrators of atrocity – a problem that has hindered return and reconciliation for many. What is perhaps the film’s most revealing moment occurs quite early, when the director shows his five-year-old son a picture of Kony and the survivor Jacob and explains the situation – in a child’s terms. The child responds, “Stop him.” Which is really the entire film in two words, on essentially the level of complexity at which it is delivered. 1) internet memes are simultaneously digital and physical; 2) internet memes are quickly spread and often 3) user generated; 4) internet memes are easily adaptable. Kony 2012 fits at least two (1 and 2) of these aspects fairly well, though I would concede that it does not quite represent a meme of the type that Davis is discussing. However, much of what makes Kony 2012 powerful arguably falls within Davis’s discussion of memes: it is simultaneously digital and physical, it was quickly spread, and the simplicity of its narrative makes it potentially extremely adaptable. To Davis’s list, then, I would add a 5th aspect that contributes to both speed of diffusion and adaptability: conceptual simplicity. Essentially: the fewer component parts there are to what is being spread, the easier it is to move things around to suit a broad range of uses and the more likely it is that what is being spread will enjoy a broad range of appeal. Additionally, the simplicity of Kony 2012 contributes to the strength of its ties to “myth” in both cultural and narratological senses. In its story of good vs. evil and its far more implicit narrative of civilized West against barbaric/undeveloped sub-Saharan Africa it is a story that cuts directly to the heart of what middle class white America often still identifies as desirable and valuable, as well as presenting an appealing and compelling (for its intended audience) tale of who white Westerners are and what their “destiny” might be. Although it is not strictly an origin story, it contains aspects of such in its presentation of an innocent and helpless generation of children destroyed by an uncomplexedly wicked man, and the affluent white saviors — their own role uncomplicated by any intrusive Ugandan agency — who will defeat evil and save the innocent. 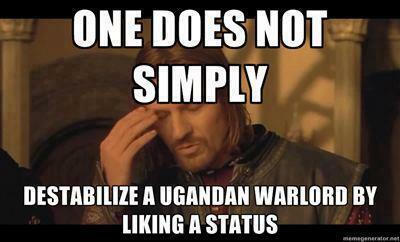 So Kony 2012’s simplicity is a direct aid in the speed of its dissemination. Other critics have written eloquently on the potential problems that accompany the simplification of a complex situation. Still other critics have written with equal eloquence on the problems inherent in such a simple and mythical narrative’s marginalization of African agency. For me, the questions I want to close with — since as yet I have no satisfactory answers — are these: If simplicity helps to give stories like Kony 2012 memetic power, can any meaningful element of that power be retained without doing violence to the truth of the situation? Can complex narratives also behave virally? Are complexity and this kind of “mythology of an augmented society” necessarily at odds? Wondered whether you might look at the "copyright debate" as an example of how complexity (the law and its philosophies) is indeed at odds with the mythologies of augmented society - if I understand the term correctly. By way of an example here is a comment made by someone on a blog about new copyright act in Canada : Will the public come to accept these increasing restrictions of copyright as just and necessary to protect the rights and livelihoods of creators, or will they see them as intrusive and the avarice of the media industry? - the avarice of industry being the mythology of augmented society since it denies our complicity in the consumption of such media. Anyway wish I could hang out with you all in April - will the discussions be archived?